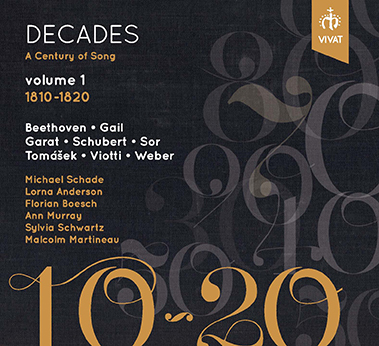 This is the first volume in a planned series from Vivat which promises a century of song, with each volume looking at songs from a particular decade. So on this volume, Decades - A Century of Song, volume 1 1810 to 1820, we have songs by Schubert and Beethoven, of course, but also Carl Maria von Weber and Goethe settings by the Czech composer Vaclav Jan Tomasek, French song from Joseph Dominique Fabry-Garat and Sophie Gall, Spanish song from Ferdinando Sor, and songs by the Italian composer Giovanni Battista Viotti. Tenor Michael Schade gets the lion's share of the songs but he is joined by sopranos Lorna Anderson and Sylvia Schwartz, mezzo-soprano Ann Murray and baritone Florian Boesch, all accompanied by Malcolm Martineau who is executive producer of the disc along with Robert King. This is a fascinating project, selecting songs by time-slicing and giving us an overview of the whole times rather than a thematic selection running across history. The problem comes when, as with the 1810s, one composer stands head and shoulders above the rest. On this disc of the 32 tracks, 16 are by Schubert and the majority of the Schubert songs are sung by Michael Schade. Now, I have no complaints about his performances but at times this feels like a Michael Schade/Schubert recital with interruptions. And I did rather want to hear more of the others. Couldn't we have had more than one Weber song? Was there really no more depth in French song at the time than the pair of charming salon pieces on the disc, what about the songs of Meyerbeer and Cherubini? And it seems a shame the Beethoven's song cycle An die ferne Geliebte had to be omitted. Part of the problem is that the majority of songs were written for domestic consumption. When composers had songs published these were usually designed to be popular with amateurs to attract sales. It took a composer like Schubert to take the genre to a new level, or Beethoven who constantly struggled to confine his inspiration within the limitations of the human voice. The recital starts with a Schubert group. Michael Schade sings Der Blumenbrief, Die Sommernacht, Taglich zu singen, and An den Mond. With a composer as fertile as Schubert (and the period 1810 to 1820 includes his miracle year of 1815 when he produced an astonishing amount of song), selection is inevitably difficult. Here we have a nicely contrasting selection all sung with a superb sense of line by Michael Schade, combined with finely expressive diction and a lovely elegance. I could easily have listened to a whole disc. Sylvia Schwartz takes over for the next two songs, Freude der Kinderjahre and Wiegenlied, again nicely contrasted with Schwartz singing with a bright vivid tones, though perhaps not quite as close attention to diction as Schade. Schade returns for two final songs Das Heimweh and Seligkeit, the first quiet and intense the second simple but effective, with its insouciant piano. The Spanish composer Ferdinando Sor is best known for his guitar music but wrote much else besides. These songs were written during his years of 'exile' in Paris (he had to leave Spain when Napoleon's forces withdrew). Sylvia Schwartz sings De amore en las prisiones, Las mujeres y cuerdas and Mis descuidados ojos. All three are charming, with lots of elegant Spanish-isms and a vocal line which combines drawing room elegance and the requisite vocal twiddles to show off. Michael Schade then returns with three of Beethoven's Goethe settings. Wonne der Wehmut has a classical feel though you sense Beethoven straining the form, and Sehnsucht also has a rather wayward edge to the music, but Mit einem gemalten Band seems at first simply delightful but gets deeper later. Lorna Anderson then sings two songs from a Parisian salon. Neither Joseph Dominique Fabry-Garat's Plainte a Hortence nor Sophie Gall's Bolleros are masterpieces, both have an elegant charm. By 1820, the Czech composer Vaclav Jan Tomasek had set forty-one songs on texts by Goethe and the two met in 1822. Michael Schade sings four of them, Nahe des Geliebten, An die Entfernte, Schafers Klagelied, and Rastlose Liebe. All four have a clarity and elegance to the German setting, and Schade's performances really enable Goethe's words to come alive in the music. Giovanni Battista Viotti is best known as a violinist, writing violin concertos particularly. Ann Murray sings two of his songs, the folk-ish Stanco di pascolar and the more operatic Privez l'amour de sa fleche cruelle, and both keep the interest firmly in the voice. Michael Schade returns for a further Beethoven and a Weber song. Beethoven's Abendlied unterm gestirnten Himmel starts with a crescendo from nothing, and develops into a striking bending of the song form which really conveys the poet's wonder under the stars. Weber's Abschied vom Leben is more conventional but strives to express the numinous wonder in the poetry. Finally we return to Schubert and Florian Boesch contributes his single song, Das Grab, providing a deep dark depth which really anchors the recital, yet Boesch manages to make the song disturbing too. Michael Schade sings the next six songs, Der Fischer, Erster Verlust, An den Mond, Wanderers Nachtlied, Rastlose Liebe, and Ganymed. Starting with the easy charm of Der Fischer, Schade gives each of these quite short songs a characteristic feel ranging from the bleakness of Erster Verlust to the strong sense of narrative in Ganymed, but all are sung with Schade's great combination of elegant line and terrific words. Finally Sylvia Schwartz gives us a lively, charming account of Wer kauft Liebesgotter. Throughout the disc Malcolm Martineau accompanies in finely elegant style, providing the varied music material with just the right sense of strength and partnering the singers superbly. The CD booklet includes and excellent article by Susan Youens which combines a good overview of the decade with song by song details. There are some lovely things on this disc, and all the performances are exemplary. Further listening to the disc has not removed my feeling that the balance of the recital is not quite right. It is shame that a two disc set could not have been managed, and then we could have had Michael Schade in a Schubert/Beethoven or an all German recital with a second disc examining what was happening elsewhere. But even as it stands the disc is a fascinating document of the varied and lively art of song making in the 1810s and I look forward to further instalments from the series. We are promised Schubert, Loewe, Mendelssohn, Berlioz and Glinka in volume 2.